The Lensbaby Composer Pro with Sweet 50 provides photographers with precise control over their composition. The Composer Pro's metal swivel ball design and ultra-smooth manual focusing ring delivers steady, fluid control over the focus and tilt making it the perfect choice for photographers looking to create ground breaking creative imagery. 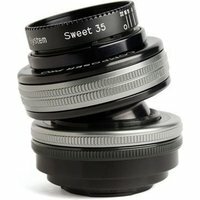 This 50mm f/2.5 selective focus optic features internal aperture blades making it easy to change your aperture and adjust the amount of effect on the fly. This lens delivers a sweet spot of sharp focus that photographers can move around the photo by tilting the Composer Pro's swivelling lens body. The versatile focal length allows you to create atmosphere and motion, elevating ordinary images to new levels.